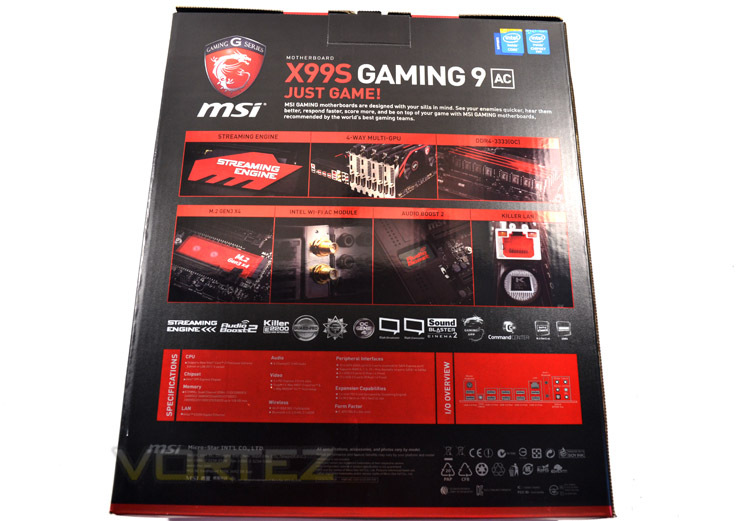 The exterior packaging of the MSI X99s Gaming 9 AC is excellent. Firstly, it is very robust without being excessively big. A handy carry handle is included to making transportation very easy. The design is sublime with MSI's red and black Gaming theme carried very well throughout the packaging. The mat black surface has contrasting glossy traces with metallic red sections and chromed Dragon logos enhancing the products visuals. The front of the package is well laid out and attractive to the eye. There a basic features uppermost with the product title on the boxes midriff. 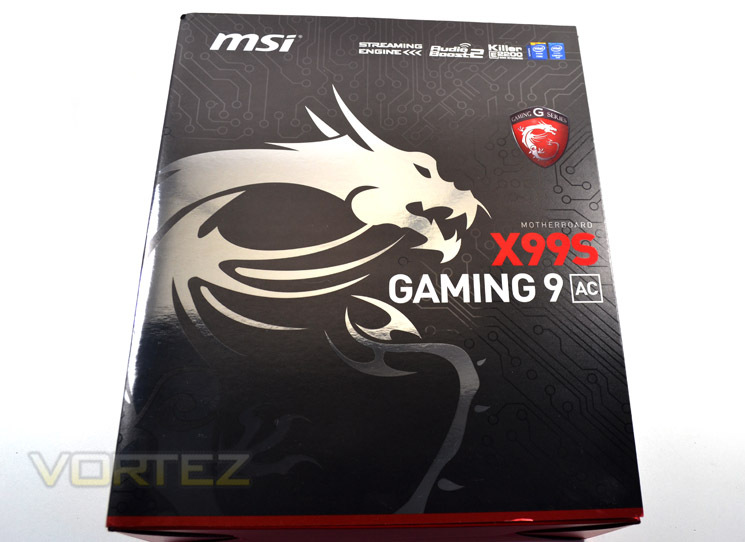 The rear of the package goes into great detail, showing off the main extra features of the Gaming 9 AC model such as Killer LAN, Wi-Fi, Streaming engine and m.2 Gen3 x4 to name a few. Below this are the main specifications of the product while opening the flip lid which is secured by Velcro goes into even greater detail regarding the motherboards features. Excessive is an understatement here. Most motherboards will come with a wealth of cables and manuals but the Gaming 9S AC takes this to a whole new level. As you can see, most of the accessories are sealed in clear plastic bags so should reach you in perfect condition, especially when you consider that the accessories are kept separate from the mainboard in a compartmentalised package. 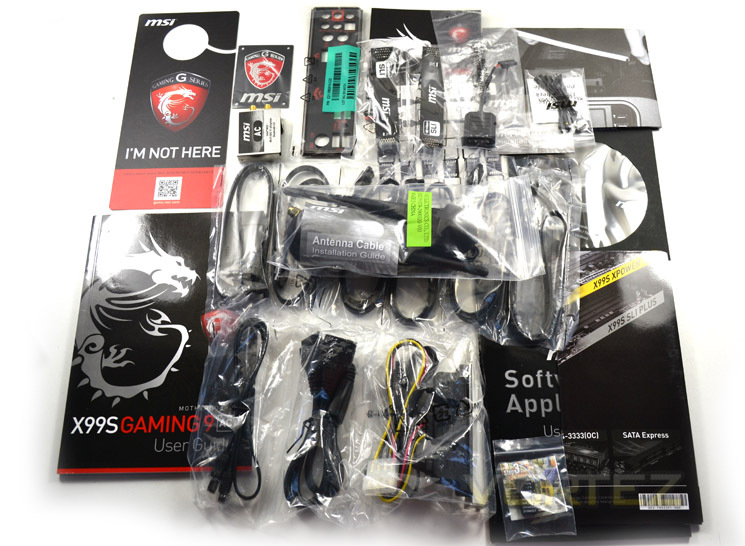 There really is everything you could want from a motherboard accessory package here. MSI have even gone to such extremes as colour-coding the I/O back plate red and black so not to spoil the look of your colour co-ordinated PC case. Excellent!